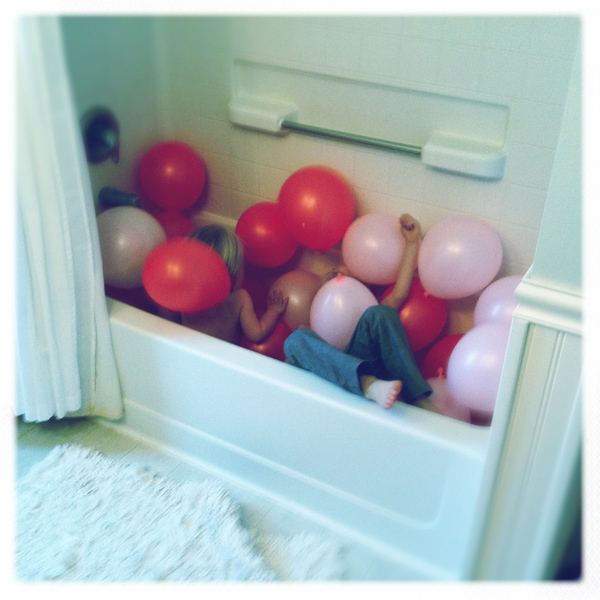 I did not think that any activities on Valentine's Day that included a bathtub would go like this! I am not sure how this idea came about but I was in the party isle at target and it was only $1.50 for a pack of balloons. I knew I couldn't go wrong when I bought them and I would figure out what to do with them once I got home. Well, no grand ideas came to mind once I was blowing them up-- I was sure that I would think of something. Truth be told it was mid-day and blowing up 20 balloons with a stuffy nose was not ideal- I was getting crabby. 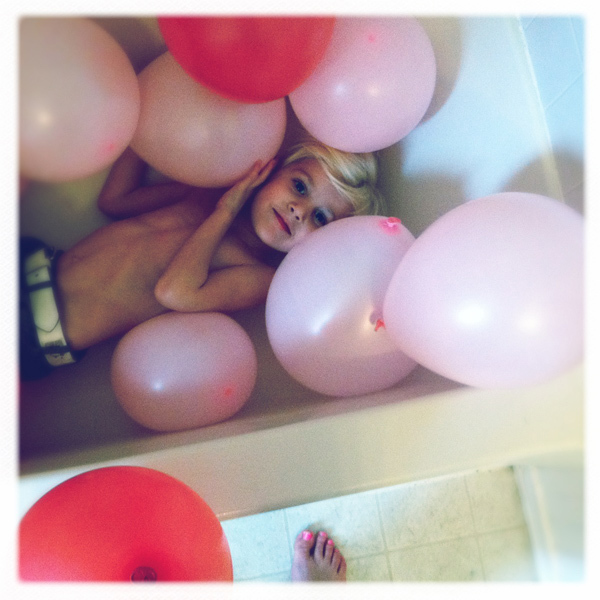 I just wanted my boys to have fun and I knew that if I hung the balloons I was sure to be bothered if they tore them down. That was when the solution came. These were balloons for the boys, not me! I wanted them to jump around in them and create havoc. I remembered the simplicity of a ball pit. Nothing special just balls. That was it! 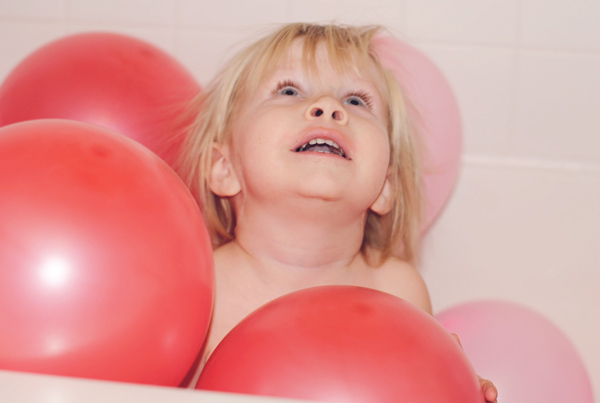 A balloon pit would be just as good! 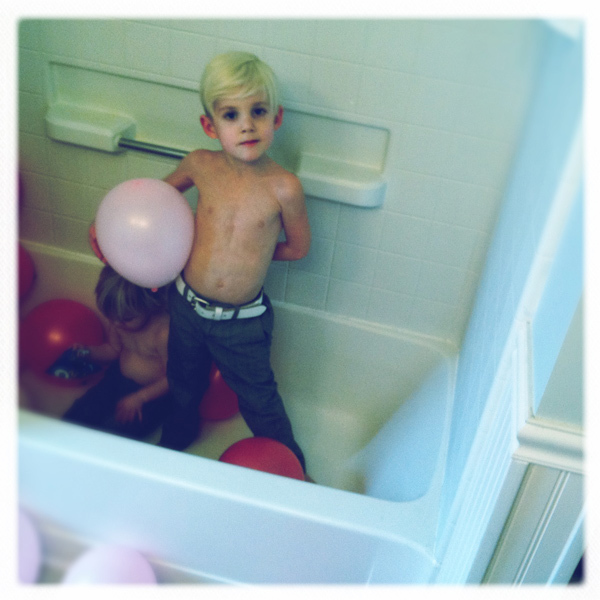 Then realized I needed a place to contain them, well that was where the tub came in. It may not have been as fancy as I pictured when I bought the balloons but it sure stirred up hours of fun and lots of good memories. If you are a mom of younger kids I really recommend this! It was so simple and inexpensive. 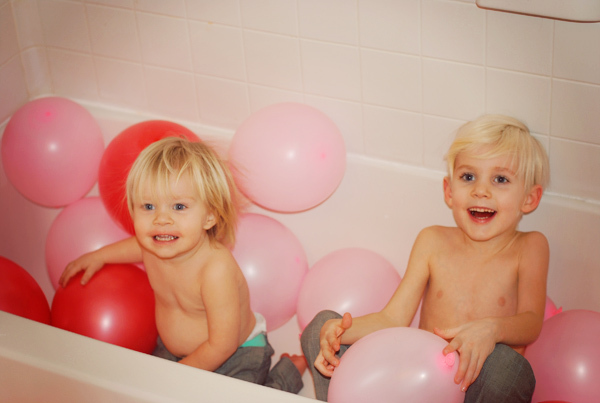 A few balloons did pop under the chaos but it didn't seem to phase either of my boys! Gosh, I LOVE this! I hope to be this fun of a Mom when Emma is bigger! I will need to steal some inspirations from you from time to time I'm sure! COPYRIGHT © 2012 PIRATES AND PEONIES . ALL RIGHTS RESERVED. WRITTEN PERMISSIONS MUST BE GRANTED. Powered by Blogger.